The kingdoms of France and England were for many centuries military, economic, cultural and colonial rivals. This is particularly true of the early modern period which witnessed the rise of French military hegemony and the expansion of English commerce. Dealing with the period 1420-1700, this collection offers a snapshot of Anglo-French relations across the three centuries from established historians and younger scholars from France, Britain and Luxembourg. Based broadly on 'diplomatic' history, but incorporating wider perspectives from cultural and social or gender history; each essay uncovers the fascinating and complex arrangements that characterize Anglo-French relations in this period. Competition and hostility between the two kingdoms there certainly was, but it took a surprising variety of forms and often proved intellectually productive for one side or the other and sometimes for both. The chapters mix treatments of broad themes and particular circumstances or individuals and each makes specific comparisons with French and English experience across the early-modern period. In so doing they elaborate and go beyond the evidence of Anglo-French hostility to explore evidence of political co-operation and cultural influences, highlighting just how close early modern England's connections with France were, even at times of crisis. 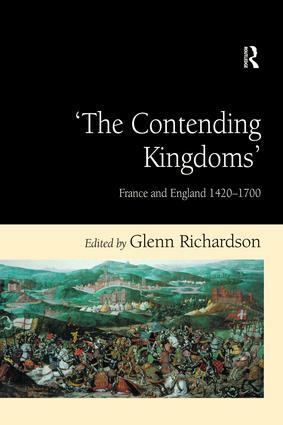 Contents: Introduction: the contending kingdoms: England and France 1420-1700, Glenn Richardson; 2 kingdoms,1 king: the Treaty of Troyes (1420) and the creation of a double monarchy of England and France, Anne Curry; France and England at peace, 1475-1513, Charles Giry-Deloison; The French and English nobilities in the 16th century: a comparison, Robert J. Knecht; Pomp and circumstances: state prelates under Francis I and Henry VIII, Cédric Michon; The French connection: Francis I and England's break with Rome, Glenn Richardson; Elizabeth I and Catherine de' Medici, Susan Doran; Richelieu and Britain (1634-1642), LoÃ¯c Bienassis; 'A stranger born': female usage of international networks in times of war, Sonja Kmec; Anglo-French negotiations on the Spanish partition treaties (1698-1700): a re-evaluation, David Onnekink; Index. Dr Glenn Richardson is Senior Lecturer in History and Deputy Head of the School of Theology, Philosophy and History at St Mary’s University College, Strawberry Hill. He is the author of Renaissance Monarchy: The Reigns of Henry VIII, Francis I and Charles V (London, 2002) and co-editor with Susan Doran of Tudor England and its Neighbours (Basingstoke, 2005).